The passenger compartment remained stable in the frontal impact test. Dummy readings indicated good protection of the knees and femurs of the driver and passenger. However, when the car was inspected after the test, it was found that spot welds had released as the front subframe was driven backwards and that this had caused a rupture in the driver footwell. This precluded any demonstration from Kia that the knees and femurs would be well protected for different occupant statures and positions, and the steering column and the edge of the centre console were thought to pose a risk of injury. In the side barrier test, the Soul scored maximum points with good protection of all critical body regions. However, in the more severe side pole test, dummy readings of rib deflection indicated weak chest protection. Cars before VIN KNAJP816LF7778250 have an earlier side airbag system with a slightly different design and deployment timing. 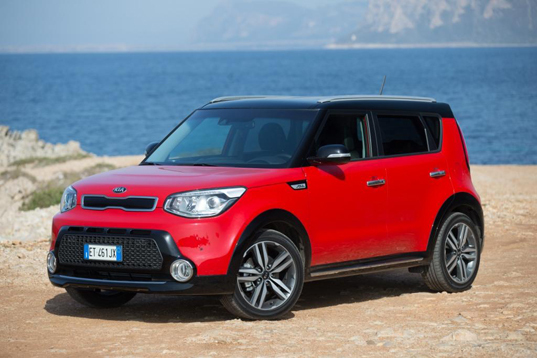 The updated design tested by Euro NCAP offers better chest protection than the original system and Kia are contacting owners of earlier cars to have their cars updated to this specification. Protection against whiplash injuries in the event of a rear-end collision was rated as good for the front seat occupants and marginal for those in the rear. The Soul scored maximum points for its protection of the 1½ year dummy in the frontal and side barrier crash tests. In the frontal impact, forward movement of the head of the 3 year dummy, sat in a forward-facing restraint, was not excessive although chest and neck loads were marginally high. In the side impact, both dummies were properly contained within the protective shells of their restraints, minimising the likelihood of head contact with the vehicle interior. The front passenger airbag can be disabled to allow a rearward-facing restraint to be used in that seating position. Clear information is provided to the driver regarding the status of the airbag and the system was rewarded. All of the restraint types for which the car is designed could be properly installed and accommodated in the Soul. Electronic stability control is standard on the Soul, together with a seatbelt reminder system for the front and rear seating positions. A driver-set speed limitation device is an option which is expected to be fitted to most cars sold so it was included in the assessment and met Euro NCAP's requirements for systems of that type. Neither a lane assist system nor autonomous emergency braking are available on the Soul.